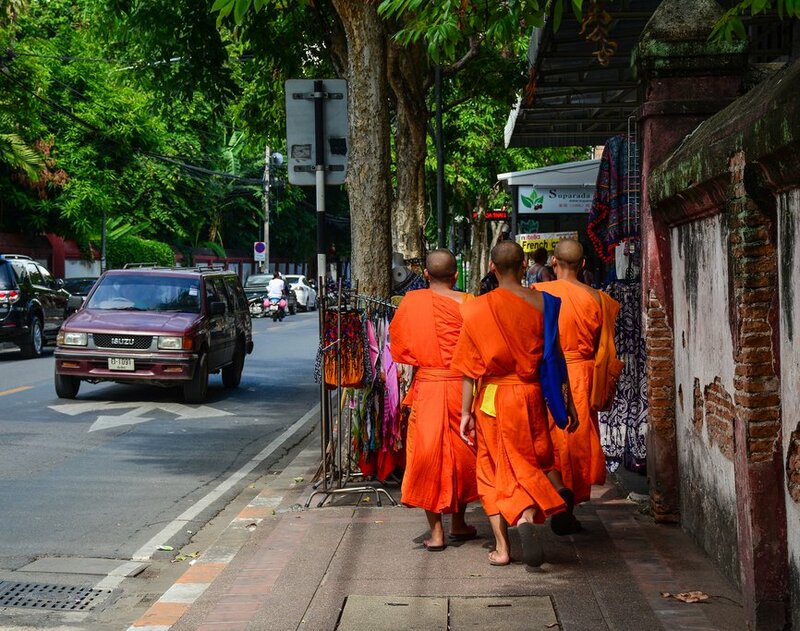 Monks walking the streets of Chiang Mai. Upon landing in Chiang Mai, you'll meet your guide at the airport and travel through the bustling streets to your hotel. Thailand's mountainous northern hub was once the ancient capital of the Lanna Kingdom, and offers both historical and modern attractions. If you arrive in the morning, head over to the magnificent Wat Srisuphan, also known as the Silver Temple, located in the city's old silversmith district. It's one of the few silver temples in Thailand, and tends to be relatively uncrowded. Tonight try a traditional northern-style restaurant. Northern Thai cuisine is generally less spicy than what you'll find in southern Thailand and often has more complex flavors. After dinner, wander around the famous Night Bazaar, where you'll find everything from souvenirs to video games to purses and clothes. Don't forget to haggle! Vendors expect it, and bargaining is all part of the fun of the night market. 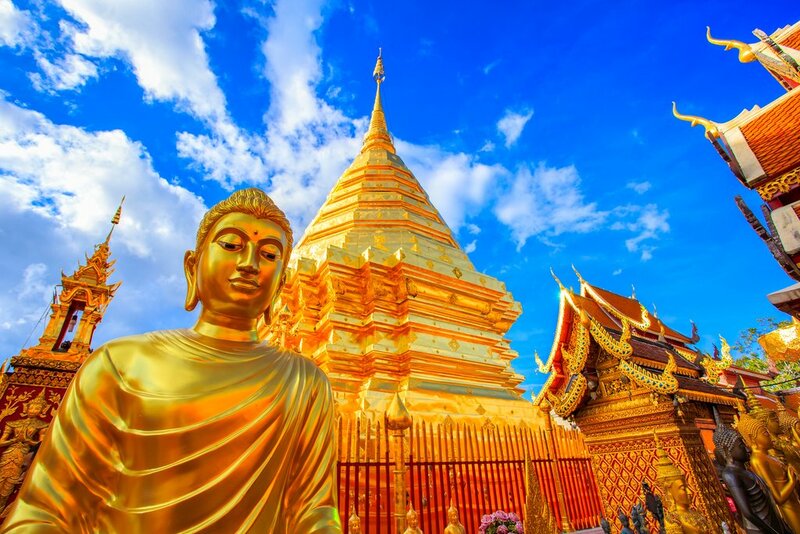 The magnificent Wat Doi Suthep, one of Thailand's most sacred temples. After breakfast, your guide will drive you to Doi Suthep Mountain just outside of Chiang Mai for the first hike of the trip. This is an easy five-mile (8 km), three-hour trek with rolling terrain along a ridge covered in pine trees and wild lilies. 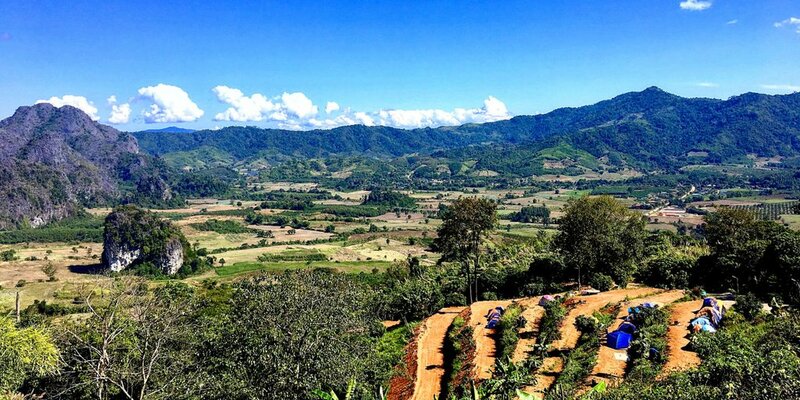 Halfway up the mountain, you'll take a breather at a local Hmong village and sample some locally grown coffee. 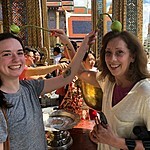 Then, trek downhill to reach the ruins of Wat Phra That Doi Suthep, one of northern Thailand's most sacred temples dating back to the 13th century. Still a working monastery, the Wat overlooks the city and is said to protect the people of Chiang Mai. After lunch, you'll drive on to the town of Chiang Dao, set in the lush jungle below a massive limestone mountain. 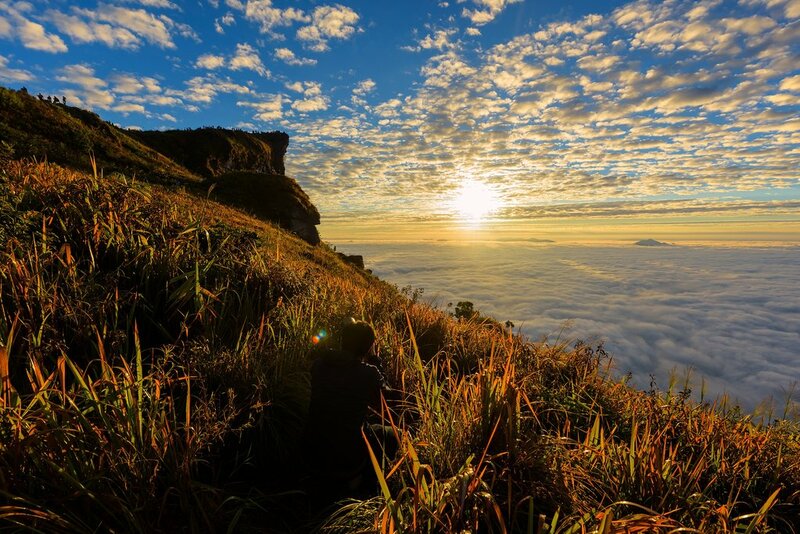 Challenge yourself to climb the third-highest peak in Thailand! 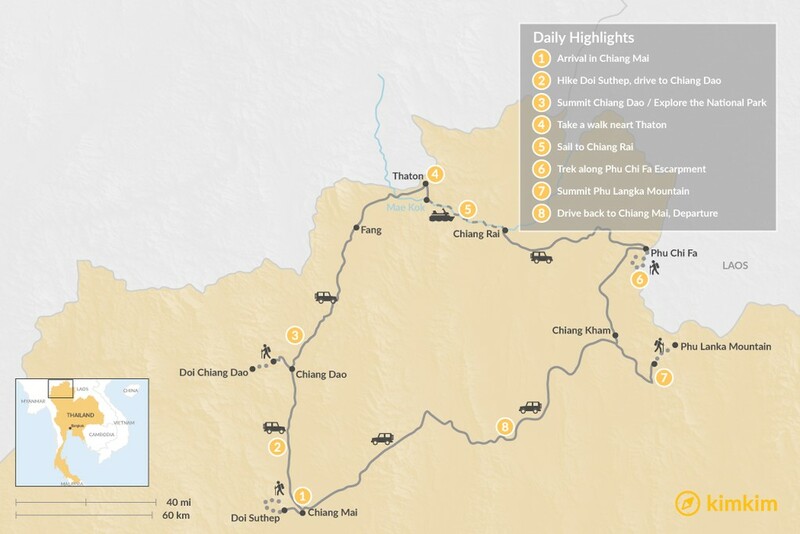 After breakfast, you'll travel with your guide to the trailhead of Doi Chiang Dao. The mountain is a popular destination for birdwatchers, but the star feature of this 8.7-mile (14 km), 7.5-hour trek is the unfettered 360 degree view of surrounding peaks from the summit. This trail is not for the faint of heart - it includes some steep inclines and a fair amount of scree (small loose stones), and you'll need to hike over a rock outcropping in some spots to eventually reach an elevation of 3,600 feet (1,100 m). You'll descend on the same trail. If you prefer a less challenging excursion, ask your guide to take you through the bamboo forest in Pha Daeng National Park in the foothills of Doi Chiang Dao. In the late afternoon, you'll travel to the town of Fang, nestled in a valley near Thailand's northern border with Burma. After breakfast you'll drive up to the villages outside of Thaton, the northernmost town in Chiang Mai province. Take it easy today with a flat, 3.7-mile (6 km) walk through the rice paddies on the banks of the Mae Kok River, or have a rest day at the hotel. Relax by the pool or the river, pamper yourself with a Thai massage, or sign up for a cooking class in Thaton. Tonight, dinner is up to you – indulge in room service, try the hotel restaurant, or venture out to one of the nearby establishments in Thaton. Wake up early to make an offering to the monks of Wat Thaton before hiking 1.3 miles (2 km) up the hillside to watch a spectacular sunrise from their temple. After breakfast, set sail down the Mae Kok River to the city of Chiang Rai in a traditional long-tail boat. Relax as you take in the mountain scenery and catch a unique glimpse of village life along the river - you might even spot elephants bathing! 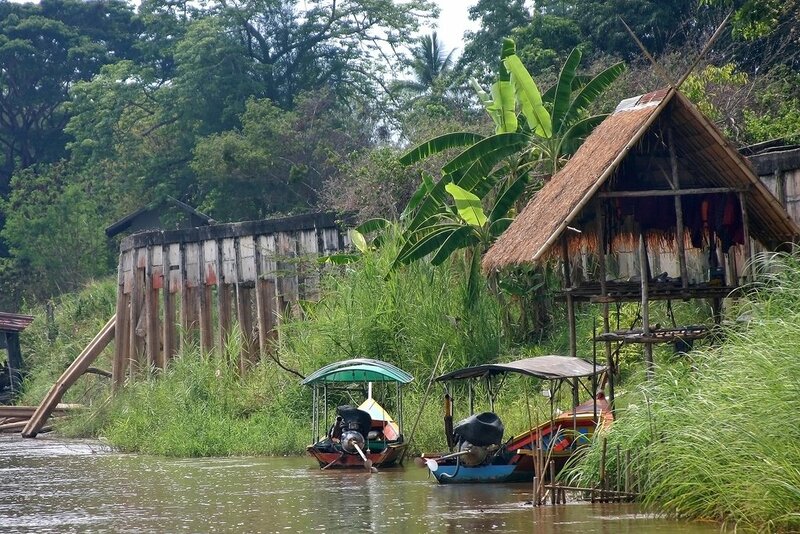 You'll dock a short drive from your hotel in Chiang Rai. In the evening, explore the night market downtown, where you'll find everything from free cultural performances to delicious street food. Sea mist overtakes the valley below Phu Chi Fa. 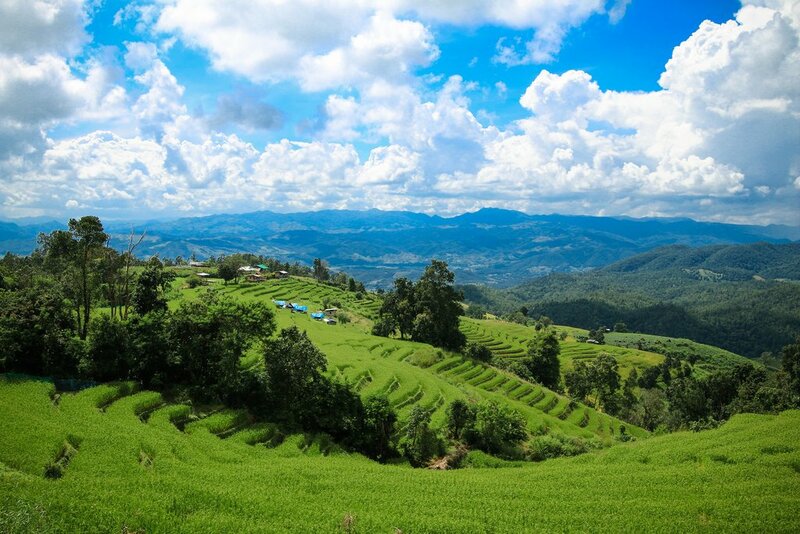 Today you'll be joined by a local Hmong guide as you trek from the Hmong village of Phu Chi Dao to Phu Chi Fa along the escarpment that separates Thailand and Laos. The 5.5-mile (9 km) trek covers up-and-down terrain, and will take a total of about four hours. You'll hike to a viewing point at an elevation of 2,300 feet (700 m), where you'll stop to eat a packed lunch and take in the dramatic views of neighboring peaks and the valley below. You'll then travel to Chiang Kham, where you'll spend the night in a hotel set among large rice paddies. For a change of pace, try some Middle Eastern fare in the hotel restaurant, made with organic produce grown on the property. Valley below Phu Langka Mountain. 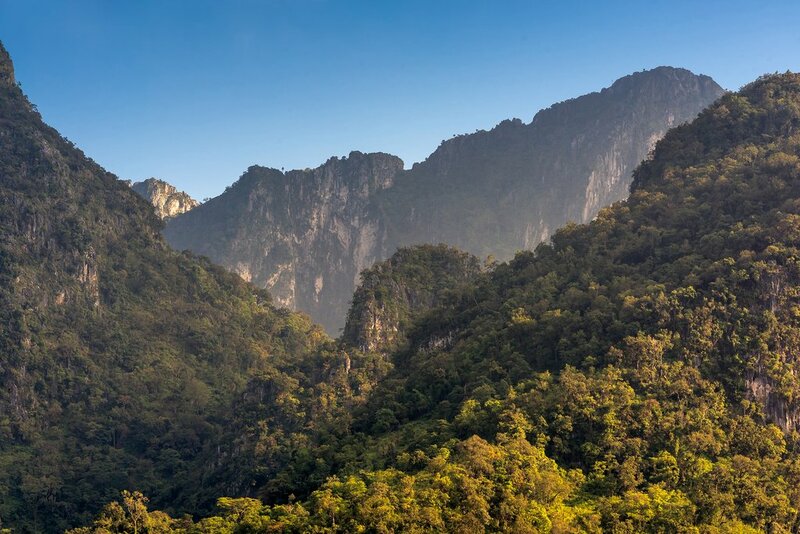 Today you'll venture into the mountains between Thailand and Laos. 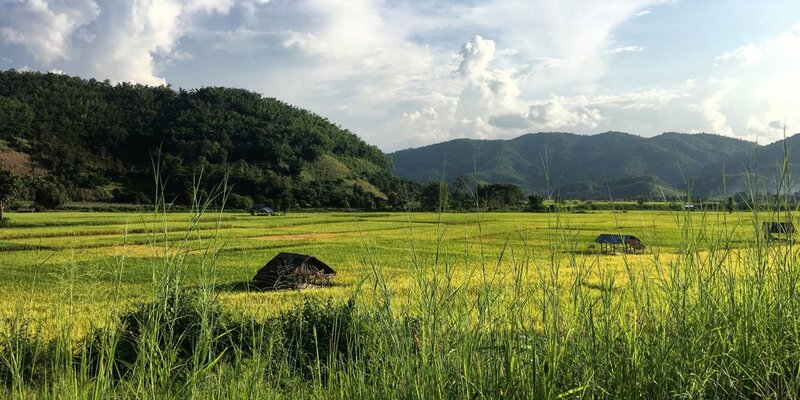 This area of the provinces of Phayao and Nan is seldom visited by foreign travelers, and is home to the Yao and Hmong people - minority ethnic groups that make up two of Thailand's seven main hill tribes. Many still live in traditional stilt wooden homes high up in the hills. 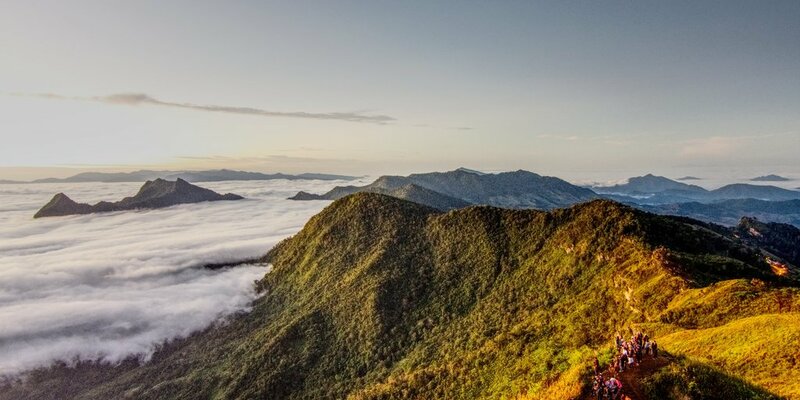 After driving to the trailhead, you'll conquer Phu Langka Mountain, one of Thailand's lesser known peaks, and take in stunning vistas of the fog-carpeted valley. You'll climb to an elevation of 2,600 feet (800 m) on this 3.5-hour, 3.5-mile (5.5 km) trek. 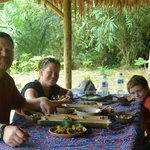 Enjoy lunch at the summit overlooking the forests and limestone outcrops of the rural landscape below. If you're up for one last easy morning jaunt, explore the terraced rice paddies to the east of Chiang Khan on the Laotian border. Stroll through the small villages on a rustic dirt road to stretch your legs before lunch. Then make your way back to Chiang Mai by early evening before heading home or on to your next adventure.